It goes on sale in April for $100/£80. When the design teams at Ultimate Ears got together to create the Boom and Roll, the end result was a set of vibrant bluetooth speakers that took cues from a can of Pringles and a flying saucer. It should come as no surprise, then, to learn that UE's new entry-level model, the $100/£80 Wonderboom, also shies away from the conventional portable form factor. You could say it looks like a small barrel, or resembles a watermelon with hundreds of rubber bands tied around it, but it's colorful, strangely cute and -- most importantly -- affordable. The Wonderboom delivers everything you'd expect from a UE speaker. It's 105mm tall by 95mm wide -- not much bigger than a can of Coke -- and delivers 360-degree sound, outputs plenty of bass and can be used in almost any environment thanks to its IPX7 waterproof rating (which lets it float in water for up to 30 minutes). The company also claims up to 10-hour battery life and 100-foot Bluetooth range. UE speakers are known for their giant rubberized volume buttons and the Wonderboom is no different. 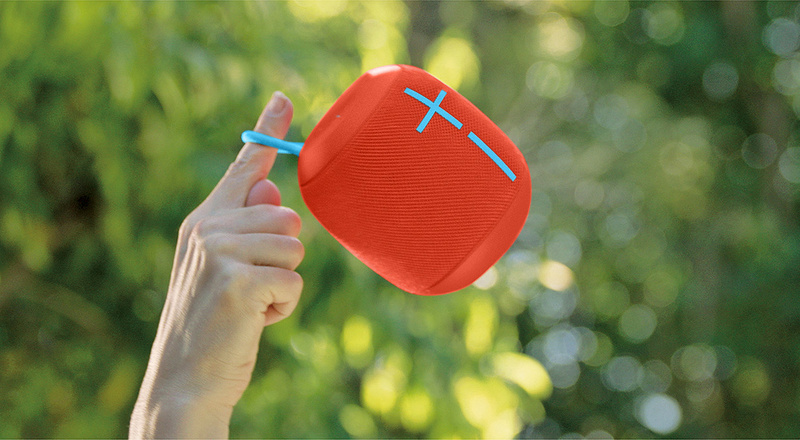 However, it also features dedicated UE button on top that lets can be used to play, pause and skip tracks, but also pair the speaker with another Wonderboom for full stereo. The Wonderboom comes in six "fresh" colors: Stone (Grey), Phantom (Black), Fireball (Red), SubZero (Blue), Cashmere (Pink) and Lilac. It'll hit North America, Europe and the UK in April and will cost $100/£80.